Winvian Resort in Litchfield Village, Connecticut has 19 buildings/rooms that are done in a different motif. 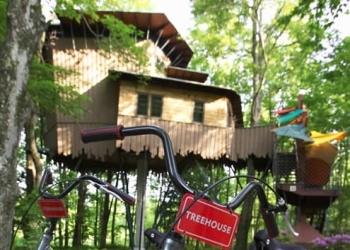 These accommodations include the Tree house Room, the Beaver Room, The Helicopter room (with an actual helicopter inside that you can sleep in), the Music Room, and the Golf Room. The resort is on a 113 acre site bordered by a 4,000 acre wildlife sanctuary. Based on a 1920s artist�s bungalow, this cottage has many artistic details including a gingerbread exterior, etched and stained glass windows, vaulted ceilings and custom art tile. The king-size bed boasts a barrel vaulted wooden canopy. The living room has an adjoining artist�s studio complete with easel and canvas on which guests can test their artistic talents. This cabin is reminiscent of a beaver�s den! The interior features exquisite hand-crafted woodwork and intricate stone masonry. The dual-sided fireplace warms the living room and sleeping area. The bathroom offers a unique waterfall tub, pebbled floors and stone steam shower. From the living area, an iron spiral staircase leads to a lofted sitting area with views of the pond and woods. 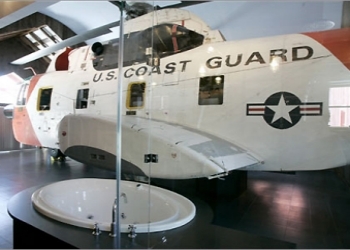 A 1968 fully restored Sikorsky HH37 Sea King Pelican helicopter dominates this cottage. The helicopter�s interior houses the bar and entertainment center. Imagine you have landed and your hanger site is of contemporary d�cor and absolute luxury. Ten meters off the ground, suspended amongst the trees, this commanding two-story cottage features an open plan bedroom and bathroom on one level, complete with threeway fireplace. One story higher, a large living area with a second fireplace can be found. This cottage is not for the feint of heart. Sway with the breeze and touch the leaves. Enjoy the camping experience Winvian style. This cottage is nestled in Winvian�s wood line and one can truly be with nature at its best. The floor-to-ceiling windows throughout the cottage afford you the experience of the outdoors while under the protection of luxury. Should you fancy a roasted marshmallow, toast away at the porch�s outdoor fireplace. This cottage is handicap accessible. This glass house is a treasure to behold. High ceilings and abundant sunlight grace the living area, while the private sleeping area affords a cozy respite. Unusual horticultural specimens complete the nature of this experience. On the Winvian grounds sits Secret Society. Very mystical in appearance, this cottage seems dark and forbidding, and yet you will be surprised by the light. Our lips are sealed, but yours won�t be. Inspired by the libraries of yesteryear, this cottage is dominated by books on double-story shelves. A ladder accesses a wrap-around second level balcony above a glorious river stone fireplace in front of which one can curl up and read. An imposing skylight brightens the cottage by day and allows for stargazing at night. This cottage is a collage of traditional forms and materials that reflect on the paradoxical concept of lighthouse imagery in the forest. While situated in the northern woods of Winvian, this nautical inspiration will transport you to the Connecticut shoreline. Imagine a night in a lighthouse without the worries of inclement weather.